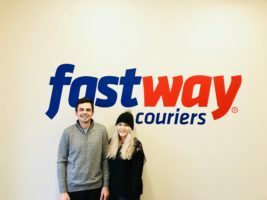 Population growth and economic prosperity in Central Otago region has led New Zealand’s leading courier company, Fastway Couriers, to increase their presence in the region by expanding with a new larger depot and increased courier operations in the region. Experienced courier operator and local Cromwell residents Brett and Sarah McLew will take the helm as the new business owner for the region which includes Queenstown, Wanaka, Cromwell and Alexandra. Fastway Couriers General Manager Franchisees Adam Greer said the Central Otago regional franchise which had previously been part of larger Fastway Otago franchise will split off to its own stand-alone regional franchise from July, and is identified as a major growth area for the business. “There has been a major uplift in our deliveries to and from the likes of Queenstown and Cromwell for some time and we looked at how we could service the region better. “We’ve now opened a new depot in Cromwell and Brett has become our latest regional business owner. He’s got vast experience as a courier driver, and is a passionate local that is keen to grow the new franchise. “There has been an explosion of residential and business pickups and deliveries due to online retail and huge opportunity for new customer acquisition.With Fastway being the preferred courier delivery partner for national and international online retail brands there is excellent opportunity for growth,” Mr Greer said. Mr McLew said it was important that locals like himself took the opportunity of developing the service offering for customers with a larger depot in Cromwell and have a team of five experienced local courier drivers across the large geographical area. “We all know Central Otago like the back of our hands, we are all experienced in the wide range of weather conditions here and we are passionate about supporting local businesses with their courier requirements but also by being a strong contributor in the community. “That is what was appealing to joining Fastway Couriers, they are big supporters in the community. Mr McLew said it was important to invest in a new depot strategically positioned in Cromwell and he is busy increasing the Fastway service offering and national efficiencies to all customers across Central Otago. “Fastway is a technology leader in the courier sector and there are many exciting new products and services that we will be offering. Fastway Couriers has won the Community Involvement Award in 2016 and 2017 at the Westpac NZ Franchise Awards for its support for Cure Kids’ annual Red Nose Day and the Cancer Society’s Daffodil Day along with Purple Heart Fun Day in Auckland and Camp Quality for families living with cancer.